I ummed and ahhed for some weeks as to whether take the plunge and buy a Chanel foundation. I asked on BH what people thought of it, watched countless YouTube reviews and read many blogs about it. I was soon convinced I had to have a Chanel foundation in my collection. 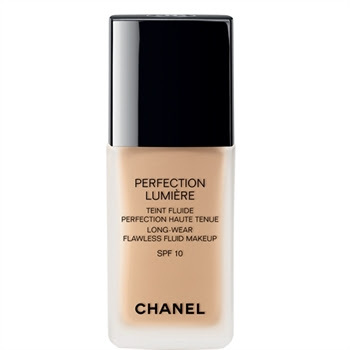 When I went to the Chanel counter in Myer, the sales assistant suggested the new Perfection Lumiere. I was colour matched to 12 Beige Rose, which is for pale skin with pink undertones. I have found that this foundation applies easily. I have used a EcoTools foundation brush, a stippling brush and a sponge. It applies well with all methods but I prefer to use a foundation brush, I find using the other methods I actually use more of the product. I have read that it can oxidise (get darker after application) on some skins but I have not had a problem with this. In my experience powdering is not necessary because the foundation has quite a matte finish, but I prefer to powder. ﻿Perfection Lumiere has a medium to full coverage, it is build able if more coverage is needed. I find when wearing it I don't need concealer. Perfection Lumiere has SPF 10 but does not look white when using flash photography. Chanel markets it as "long-wear flawless fluid makeup" and I agree. It looks flawless after hours of wear - no melting makeup! Wearing only Perfection Lumiere, no powder or other make up. Perfection Lumiere wears well. The first test I gave it was my cousins wedding the day after purchasing it. I wore it for about ten hours through sitting in the sun during the ceremony to being outside in hot weather waiting for the reception. I sweated and my skin did not look oily and I did not powder during the night since first applying the foundation. My make up still looked flawless when I removed it after approximately ten hours wear. What really sold me on this foundation is my Mum was wearing a Maybelline one and she looked sweaty and her make up had half melted off, didn't happen to me though! ﻿Availablity: Chanel beauty counters at Myer, David Jones and selected pharmacies. Have you tried any Chanel foundations? Does the Perfection Lumière foundation oxidized on you went you first apply for the first 15-20 minutes?